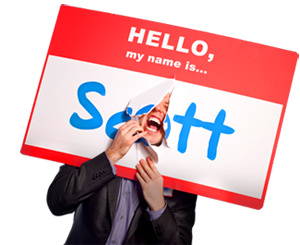 13 Service Phrases That Payses - HELLO, my name is Scott! 1. Come on down! A nice alternative to the unfriendly and overused, ‘Next in line!’ Not only will the next customer create an immediate mental picture of a game show (which is always fun), but also the other people in line won’t be able to help themselves from smiling. 3. Excuse my annoying typing; I just want to get all this stuff down! Similar to the above example. Polite, humorous way to subtlety demonstrate active listening while on the phone. 4. Fortunately, I work miracles! When a customer comes to you with a problem, say this immediately. First of all, it’s funny. The humor will diffuse the customer’s anger. Secondly, it’s positive. Lastly, it’s reassuring. 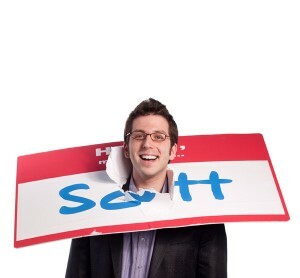 I recently exchanged a vest at an Old Navy store that didn’t have my size. When the cashier told me she worked miracles, I was immediately excited and confident that she could help me. Interstingly enough, we never found the right size. But I almost didn’t care due to her positive, friendly response. 5. Hang on for ten seconds. Especially on the phone, this tells someone that you really will ‘be right back.’ With the limited time each person has to talk to you on the phone, sentences like this speed it up. They will usually count, too, just to see if you really come back in 10 seconds. Remember, specificity = credibility. 6. Hang on; I want to write this down. Great in person, greater on the phone (since they can’t see you.) It’s the difference between showing and telling. This phrase lets them know you’re listening, taking notes, and encourages them to offer more detailed answers. 7. I am at your service. Not just for customer service professionals any more, but for everyone! All business professionals are at the service of somebody, be it their customers or coworkers. Say this phrase to reassure your client that you’ve got their back. Remind them that they can ask anything of you. Also a great phrase to use with new members of an organization, guests at a meeting or new congregants at a church. 8. I have no excuse. When you mess up, own up. Most people make excuses for their mistakes instead of taking personal responsibility. By using this phrase early in your conversation, you lay a foundation of honesty and accountability that separates you from most people. But remember, this sentence only works if followed by an action plan for correcting your mistake. 9. I need your help. When approaching a service agent or receptionist, this opening line appeal to someone’s instinctive helpful nature. You’re likely to get a better response (and better service!) if you use this line. 10. I’d be happy to. When I worked for Ritz Carlton, I was trained to say this as a response to every request. Not ‘more than happy to,’ and not ‘no problem,’ but ‘I’d be happy to.’ It’s such a simple addition to mundane phrase, but WOW, does it sound ten times better! 11. I’m your partner in this. Known as a ‘Together Phrase,’ this sentence reassures your colleague or staff member. It also keeps you personally accountable by verbally declaring ownership. 12. I want to make sure it’s the way you like it! Burger King, eat your heart out. Try this phrase to remind customers you’re dedicated to their needs. It’s personal, goal-oriented and, more importantly, customer oriented. 13. Let me give you an example. Keeps someone engaged, helps he or she follow you and the conversation. Be sure to offer an example as support for your point. Think of it this way: would you rather read ten pages of paragraphs, or small, bite-sized sections with subtitles?